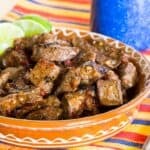 A simple marinade adds amazing rich flavor and delicious caramelization when you fire up the grill to make this easy steak recipe. Honey Balsamic Marinated Flat Iron Steak is an easy way to take your summertime steak dinner to the next level. Mix together this five ingredient honey balsamic marinade recipe and fire up the grill to make your ​Certified​ ​Angus​ ​Beef​​®​ ​brand grilled steak taste incredible. It has the deep, rich flavor of balsamic vinegar and Dijon mustard and the perfect amount of caramelization for a sweet and smoky crust and a perfectly tender, melt-in-your-mouth texture. Add this honey balsamic marinated steak to your list of favorite grilling recipes. Disclosure: This​ ​post​ ​is​ ​sponsored​ ​by​ ​the​ ​Certified​ ​Angus​ ​Beef​​®​ ​brand​ ​in​ ​conjunction with​ ​a​ ​social​ ​media​ ​campaign​ ​through​ ​Sunday​ ​Supper​ ​LLC.​ ​All​ ​opinions​ ​are my​ ​own. Mix together five basic ingredients plus salt and pepper then let your flat iron steak marinate for several hours or overnight. You won’t even have many dishes to wash if you combine everything right in a plastic bag. Then fire up the grill and after just several minutes per side you have a Honey Balsamic Marinated Flat Iron Steak grilled to a perfect medium rare. Slice it against the grain and devour because with the Best Angus Beef and this easy marinade recipe, you don’t need anything else for the best steak you’ll make this summer. I’m a lazy steak girl. I see all these recipes for rubs and marinades and sauces and compound butters, and do you know what I usually do? I sprinkle salt and pepper on my steaks before grilling and call it a day. If I am feeling really ambitious I will break out a steak seasoning. I mean, shouldn’t the flavor of the steak just speak for itself? That’s my excuse and I’m sticking to it. And then to make it even worse, I call for the hubby and tell him it’s time to grill the steaks. Yep, you got that right. I don’t even grill the steaks. To be fair, I’m usually inside whipping up some side dishes like Whipped Cauliflower Gratin with Goat Cheese and Thyme or Maple Dijon Apple Cole Slaw. Well, except when I also hand the hubby a bowl of veggies and maybe a sliced pineapple and tell him to grill those too. I’m the worst. But at least I open the bottle of wine. So you guys, if I made a marinade, was patient enough to actually let the steak marinade, and I even grilled it myself, you know this Honey Balsamic Marinated Flat Iron Steak is super easy. And it’s also super delicious. A flat iron steak is also known as a Shoulder Top Blade Steak, Top Blade Filet, or Top Blade Steak. The flat iron steak is a richly flavored steak and well-marbled to keep it nice and juicy. It is an economical choice, as it is usually cheaper than the same grade of rib eye or strip steak. The flat iron steak is perfect for sauteeing or grilling. Check out these flat iron steak recipes from the Certified Angus Beef® brand website. Mixing up the marinade right in a zip-top plastic bag not only saves extra dishes to clean, but if you press out the air, you ensure the marinade contacts every surface of the steak for the entire time. Just a half hour in the fridge is enough, but you can certainly let it marinade longer to really infuse the flavor. A meat thermometer will ensure you hit the right temperature for medium rare perfection. Don’t forget to let the steak rest for five minutes or so in order to allow the juices to redistribute and keep your steak moist. Thinly slice the flat iron steak against the grain for tender, melt-in-your-mouth bites. 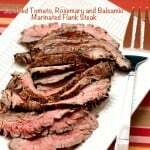 This marinade is also delicious for a flank steak or even some steak bites. And of course be sure to pick up a Certified Angus Beef® brand flat iron steak or your steak of choice. Why Certified Angus Beef® brand? Certified Angus Beef® brand is truly a cut above even Choice and Prime steaks because it must meet ten demanding quality standards. These standards ensure flavorful, tender, and juicy cuts of meat that make it the choice of 15,0000 of the most elite restaurants and retailers around the world. I get my Certified Angus Beef® brand from my local Weis Markets, but you can use the product locator to find you local retailer. Make sure you get more information about Certified Angus Beef® brand on their website, plus get tons of information and recipes ideas by following them on Facebook, Twitter, Pinterest, Instagram, and YouTube. A few basic ingredients you probably already have in your pantry come together to make a delicious and juicy flat iron steak. 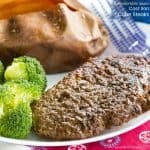 A half hour in the fridge and a few minutes on the grill will give you a delicious steak dinner the family will love. 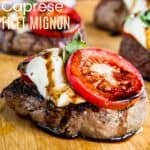 The balsamic vinegar tenderizes and flavors the meat, the honey caramelizes on the grill for that sweet and slightly charred flavor, and the Dijon mustard adds just a bit of zing. This honey balsamic marinade recipe is sure to be your go-to for grilling season. Combine balsamic vinegar, olive oil, honey, Dijon, garlic powder, salt, and pepper in a bowl or plastic bag. Add the flat iron steak to the bag and seal or place the steak in a shallow glass baking dish and pour the marinade over the steak and turn to coat. Marinate in refrigerator for 30 minutes. Remove steaks and discard the marinade. Grill 3-5 minutes per side to 135°F for medium rare or to desired doneness. Remove steaks and let rest 5 minutes, then slice thinly across the grain.